Three cheers, hats off to the author! Sandy, Lorena has to be one of the most interesting and lovable characters ever imagined. I think you did an amazing job keeping her “in character” all the way through the series. She seemed always to be herself, yet she could surprise along the way as she encountered new situations and new people. And I always loved the times when she expressed herself verbally. It was brilliant to place at the very end of the book her spontaneous and generous/hilarious/serious offering of Chet’s educational services to Richie and Sadie. Such a good way to say goodbye to St. Anne—with a smile, and with the warm sense of the ongoing-ness of that tolerant and diverse little community gathered around Celeste. I’m not sure where I wanted Celeste to go in her musings about death, but I thought they added a lot of substance to the book and were very believable. Her ambivalence about whether to be alone or part of the group made sense, and my impression was that she was not quite the same person when she returned to the house as she’d been before going to the cottage. I guess, in fact, that’s one of the aspects of the series that I most appreciate: you’ve created characters (and situations) whose lives are rolling along and are changing in big and little ways, ordinary ways often, the way people’s lives tend to do. And you don’t wrap everything up entirely neatly—maybe Aggie’s arm is getting better; maybe Mare and Bobby are together for the long haul; maybe the little girl and the teenage boy will be ok; and maybe Celeste will find the peace and insight she’s looking for, etc. And, good storyteller that you are, you make me really want to know what’s going to happen to Aggie, and what Lorena will be like, years hence, as mom to a teenager! And Chet as dad! Anyway, thank you for these books. I really enjoyed them and admire your capacity as a writer to have produced them. Series appeals to men and women readers alike! more from readers on "through the lane to St. Anne ... Four"
finished #4 yesterday, left me both wanting more, and accepting that they will all go on without me. Celeste's ponderings were intriguing. Thank you so much for these delightful people, and their richly interconnected lives. It has been a joy to peek into their world. And the beat goes on, lively as ever. What a great journey you are taking us on, thanks for the ride......Now, as before, I am torn between wanting to read the next book, and lingering in this one, and hoping the story won't end. 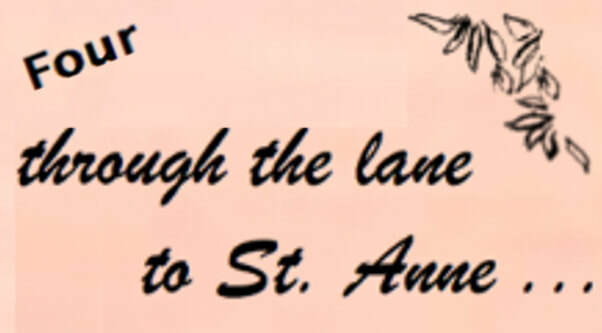 More Readers' Reflections on "through the lane to St. Anne ... Three"
<< I’ve been thinking about St. Anne. I don’t have anything profound and will probably be repeating comments I made after reading One and Two. You are really skilled at getting dialogue to come across as natural and easy—so real sounding, and believable. You maintain the voices of each character so faithfully. Of course I love Lorena. She's honest, charming, frustrating, predictable yet unpredictable, and often full of wisdom, especially toward Aggie. Wonderful moments when she goes calling out the door to Chet about bread baskets, or gets her shrimp farm inspiration, or lets Chet know that at least one of them has to live to 103. I also appreciate your characterization of Celeste. In some ways, she’s the perfect matriarch/queen of the whole St. Anne operation; yet she’s fallible and sometimes doesn’t see things quite accurately and makes mistakes that others have to call her on. But she’s ultimately open to being honest about herself and comes right eventually. In this book the character I still want to know more about is Mare. It was good to have her back and to get a glimpse into what makes her tick; but I’d like to see more of her and understand her inner workings better. I want her to be happy. And it would be fun to watch her and Aggie as they both develop. Bobby, too, of course. Your mention of “wobbly-do” on p. 54 applies for me in more than one place in all of your books, which I find to be one of their great delights. I know that if I stick with you, things will come clear eventually. I like your not-exactly-straightforward ways of telling the story. The details are important and make sense sooner or later. You’re such a careful writer. You’re not just getting the narrative down any old way. And if you haven't yet been, you'll want to meet Lorena, Chet and the others as they show up on the lane. You'll find One and Two in order, on amazon.